Our Chargers Social Media Specialist John Kegley was embedded with the San Diego Chargers Wide Receivers and Linebackers groups today. The San Diego Chargers put on an event for San Diego called #ThankYouSD. The Chargers sent out seven caravans that had different position groups (running backs/specialists, linebackers, quarterbacks, defensive backs, offensive line, defensive line and wide receivers) along with the Chargers Girls, Coaches and staff. The players visited fans in places ranging from the Gaslamp, Sports Arena, Point Loma, Mission Valley, La Jolla, Mira Mesa up to 4S Ranch. 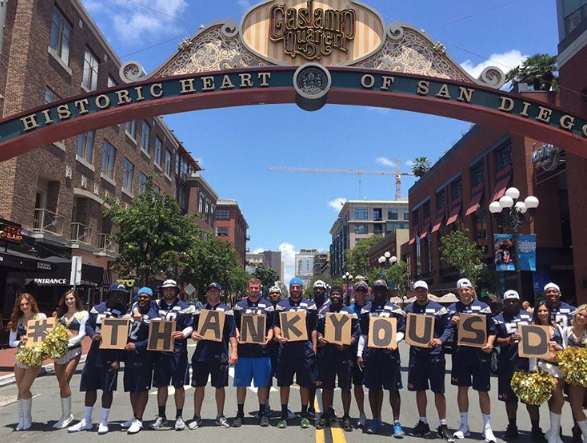 The players and organization tweeted out from their locations (Only known by staff, players and media) between the hours of 12:00 pm and 3 PM using the hashtag #THANKYOUSD. The hashtag allowing thus allowing fans close by to drive/walk over and meet the players. It also allowed social media to follow the party. Chargers President A.G. Spanos on why the Chargers put on #ThankYouSD,” “We’re taking this opportunity to thank fans for caring about the team and invite them to share our excitement about the 2016 season.” The last time the Chargers participated in #ThankYouSD was in June of 2013. John Kegley met up with the San Diego Chargers Linebacker core in San Diego’s Historic Gaslamp Quarter. The LB’s were joined by Chargers HC Mike McCoy. Jeremiah Attaochu was having a blast with the fans and running the Bolts SnapChat. Manti Te’o was running all over the place speaking to fans. He was excited to speak to a few Notre Dame fans. Overall the players were interactive, walking into stores and restaurants meeting with fans. John had a chance to quickly interview the Chargers 4th round (102nd) draft pick of the 2016 NFL draft Joshua Perry out of Ohio State University. John: How do you like doing this event? Perry: Been pretty fun, getting to interact, its kinda my first time interacting with the fans so its pretty fun. John: What’s been your favorite part of being with the Chargers? Perry: Tempo, pace, and the direction things are going with this team. John: What’s been your favorite part of San Diego? Perry: Great weather, easy-going people, something that’s easy to adapt to. Ikea had a ton of employees waiting inside excited to welcome the Chargers players. The employees had a fun friendly table making competition game all set up for the WR’s. The game was between Dontrelle Inman (#15), Travis Benjamin (#12) and Deandres Reeves (#88). We have a short video of the competition that you can watch. The players then roamed through Ikea, even took a second to lay down on some coaches and get some rest. The Chargers girls also made an appearance with the players and took photos with fans. As the players were getting ready to leave Ikea they got treated to free Ice Cream by Ikea staff. The players then spent some time walking through a few stores and restaurants before heading back to Chargers Park. John also had a quick interview with Travis Benjamin and Keenan Allen. John: How do you like doing this so far? Travis: Its been cool, getting to see people. I’m new here so this is my chance to get to know the city and meet the fans. John: Whats been your favorite part of being with the Chargers? Travis: The competitive spirit, will to win. John: Whats been your favorite part of San Diego? Travis: The weather, the fans have treated me like family since i been here and i hope for that to continue. John: What do you like most about doing this? John: How well have you recovered? John: What was you mind-set during the injury process? Keenan: Get back be 100 percent. 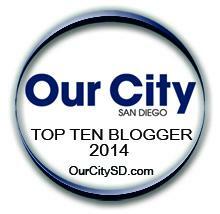 Here is what the other position groups did around San Diego.